On March 20th, Lollapalooza announced its 2019 festival lineup. This year seems different than more recent years, which has caused disappointment from Lolla fans. This reaction from fans isn’t entirely fair, as it ignores the acts that make the lineup great in its own right. 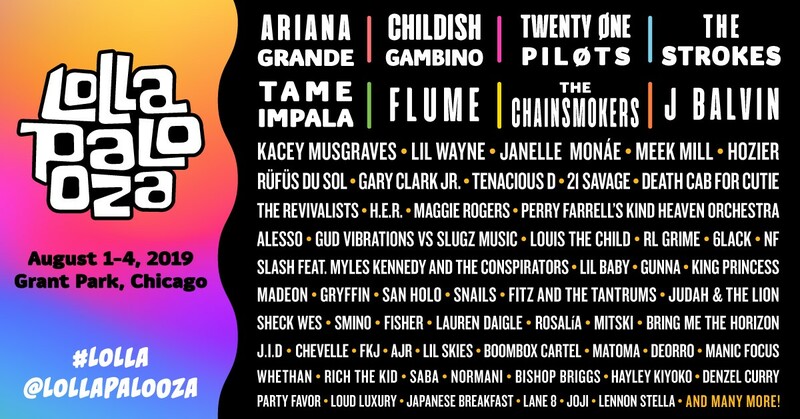 In recent years, the Lolla lineup has featured a litany of big-name artists that stretched almost halfway down the lineup page. Included in those headliners were countless rappers and hip hop artists, alongside DJs and EDM artists. Most of that had to do with the explosion of those genres; rap, hip hop and EDM took to the mainstream rapidly in the past couple years. Lolla’s lineup reflected that, as they continued to recruit well-known artists to play the four-day festival. This year, however, looks a little different. “Big names” don’t last more than a few lines on the festival’s full lineup poster. While there’s still a significant number of rappers and mainstream artists, there’s more genres to the lineup than just what’s popular. The lineup represents artists from countless genres of music, many of whom don’t see a lot of mainstream attention. There’s heavy metal bands, independent artists, R&B musicians, punk bands, pop punk bands, emo rappers, soul musicians, art pop, all of whom are still a relatively small sample of the genres featured. There are names on the poster that many people have probably never heard before. Take, for example, the emo rapper nothing,nowhere. His name appears farther down the list where most people tend to skim through the names aimlessly. He exemplifies what the genre is all about with his powerful lyrics and melodies. Emo rap, according to Spotify, was the fastest growing genre of 2018. Yet it still remains a genre that most people don’t know exist. On the heavy metal side, there’s British band Bring Me the Horizon. Despite having been nominated for a Grammy this year for Best Rock Song, they still remain a band who’s unknown amongst mainstream and radio listeners. The trio of brothers known as AJR are also going to be performing at Lolla. They’re representative of the rising DIY model in music, as they produce their own music in their living room and aren’t signed to any major label. While they do get some radio play and some attention from the mainstream, they’re still an independent band doing their own thing and many people don’t know of their existence. There’s more unknown names on the lineup than known — and that’s the point. Lollapalooza was created in 1991 as a music festival that toured across the country and it highlighted bands who were out of the mainstream. It’s a call to bring people together to listen to music they probably never would’ve thought to listen to without the festival. This year’s Lollapalooza is going to be a celebration for fans across many different genres. It’s bringing together genres of music that would most likely never cross paths. How often do you see EDM and heavy metal artists perform in the same place? This year’s lineup is a necessary return to what Lolla used to be. It’s no longer mostly-mainstream artists that inevitably dominate the stage for the entire festival. It’s a place of discovery, of inclusion. Anyone is welcome at Lolla — if you can afford the steep ticket prices, that is. While this is a chance for smaller bands to find a bigger audience, the ticket prices seem to negate that. The people who can afford tickets are a smaller group of people than if the tickets were cheaper. The high prices mean that the new audiences for these bands are a wealthier pool of people, rather than one that represents people from all walks of life. Even though more mainstream genres still have larger billings, there’s more unrepresented genres that make the lineup than in more recent years of Lolla. This year’s lineup returns to one principle that was lost among Lolla lineups long ago: Lollapalooza is for everyone, not just the mainstream music fans.